As a native Texan, this is not the normal I knew. And for those outside Texas, think of the magnitude: You could fit the cities of Boston, Chicago, Manhattan, San Francisco, Santa Barbara, and Washington, D.C. into the geographical area of Houston. So how does Hurricane Harvey fit into the new normal? Here are three things we know for certain. 2017 was a devastating year of natural disasters, by any measure, from wildfires in several western states to intense heatwaves in the Southwest to Harvey, followed closely by Hurricanes Irma and Maria. 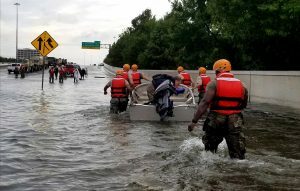 Thanks to the improvement in climate models, scientists are now better equipped to attribute climate change effects to individual natural disasters. A recent study by hurricane experts in the Proceedings of National Academy of Sciences found that Harvey’s unprecedented 51 inches of rainfall in the Houston area, as well as wind speeds in other parts of the state, were three times more likely and 15 percent more intense than without climate change. The study even called the rainfall “biblical” – as in, it has likely occurred only once since the time the Old Testament was written. In Texas now, the odds of another Harvey-like rainfall could be nearly 1 in 5 per year by 2100 – put another way, rain of this magnitude could hit the state 18 times more often by the end of the century. Storms that have more than 20 inches of rain in Texas are about six times more likely now than they were at the end of the 20th century, just 18 years ago. Climate change did not cause Hurricane Harvey, but it certainly made its impact much worse. Like an athlete on steroids, climate change enhances the performance of an already powerful force. According to the National Oceanic and Atmospheric Association (NOAA), the costs from all the 2017 natural disasters clock in at $306 billion – and Harvey comes out on top at $125 billion. Not only is that figure staggering on its face, but if the political leadership continues to go forward as business as usual, the costs of inaction will dwarf these. Furthermore, these official numbers do not include things like economic impacts in the community, health costs from air and water pollution, mental health costs from the trauma of natural disasters, and repeatedly continuing to rebuild. Agriculture: Texas A&M University estimates crop and livestock losses at $200 million, with cotton and livestock representing $193 million of that. With Texas leading the nation in cattle and cotton production, those are serious numbers. Fishing: While Gulf oysters took a hit from Harvey, the economic impacts to the fishing communities, especially many immigrant and immigrant-descendant families, along the coast will be felt for a long time. In addition to gear and infrastructure losses, the long-term effects on the marine ecosystem are still unknown. In particular, since oysters filter a lot of water, the loss of oyster populations may have an effect on the bays’ overall health. Oil and gas: 20 percent of offshore oil and gas production was shut down. If we do not act to mitigate further damage, while adapting our infrastructure and our systems to the reality of climate change, we will face dire financial consequences that may prove impossible to work around. And for many, climate change will increasingly mean moving, not just rebuilding. Some towns and communities along the coast that have fewer resources than big cities like Houston, such as Rockport and Port Aransas, may never fully recover. Plus, Houston’s no-zoning policy means a lot of pollution and petrochemical hazards are concentrated in one part of the city, which is largely populated by people of color or people with low incomes. Harvey unleashed a toxic stew in these neighborhoods and the communities, which already have fewer resources for rebuilding, may be permanently displaced. Storms don’t discriminate – some of the wealthiest areas in Houston were flooded – but climate change will hit vulnerable communities the hardest. As Harris County Judge Ed Emmett put it, “Three 500-year floods in three years means either we’re free and clear for the next 1,500 years or something has seriously changed.” Unfortunately, the reality is the latter. We have the data. We know the stats. There is no excuse to not act on climate change. The leadership of Texas and the U.S. have a duty to protect the citizens and property of this state and country. Ignoring the new normal is reckless. This is the first in a series of posts evaluating the aftermath of Hurricane Harvey and offering tactics to avoid the worst effects going forward. The next post will examine impacts to public health. This entry was posted in Climate Change and tagged Hurricane Harvey. Bookmark the permalink. Both comments and trackbacks are currently closed.